Can a student learn through Social Media, or is it completely waste of time? From time to time, studies show that social media is a big distraction for students. Still, teachers are bringing real-world experiences into their classrooms, as well as the ability to encourage collaboration between students with the help of social platforms. If use strategically, social media provides creativity and learning opportunity. But first, let’s see some of the not so good social media habits for students. How a Student waste his/her time on Social Media? You are addicted to a social media platform. Facebook tops the list in terms of addiction for students. You post something, a status or a photo, and your mind is still attached to that post. You check out comments, likes and shares on your post at regular interval. Frequent notifications makes it worst. The only thing you do on social media platforms is sharing photos, motivational quotes, and playing games. 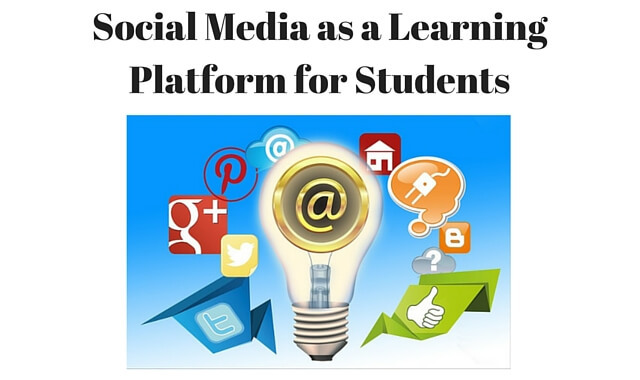 How a Student can utilize Social Media as a Learning Platform? There are number of ways a student can use social media as a perfect guide and to learn something new every day. Look out for groups or communities on social media platforms where you can post your questions and can ask for doubts. Identify those who respond to your comments, give you answers, clear your doubts. Learning from social media is most effective when it’s a two way communication. Social media is a hub of information. The ability to assess, analyze, retain and share information is a great skill to have. If you love science, then there is an opportunity to get information related to science, it can be a specific field of physics, chemistry or biology. You can also discuss various theories and research with experts on social media platforms. The learning from social media platforms is not limited to your syllabus only. It goes beyond that. Educational videos and inspiring stories are equally important. Social media allows a student to develop skills like communication building and gives opportunity to connect with students and educators from diverse places and backgrounds. The online engagement that a student experience on social media is a big boost for his/her career in the future. I am not saying that you should ditch social media and focus more on regular studies. But you can do at least one thing. When you are studying, doing homework or assignment, disconnect yourself from social media [Unless it’s a part of your assignment or assisting you in your homework]. I always advise students to do whatever they love to do. If spending time on social media makes you happy, do it. But at the same time, use your time on social media to learn something. If you are a student of class 11 and 12, preparing for IIT JEE, NEET, KVPY or any other competitive examination along with your school studies, then it’s best to take a break from social media for some time. You can use it for resolving your doubts or problems, but that’s it. Nothing more. Have something to say about this article, or any question in mind? Share it with us on Facebook.